I like the realistic finish. The more realistic paint job better suits the model- personally, I was never a fan of the cartoony style that GW adopted at the time. This is fantastic. I love the realistic look. I also love that the wooden handle of the axe isn't brown. I'm going to try and see if I can replicate it. Excellent brushwork! 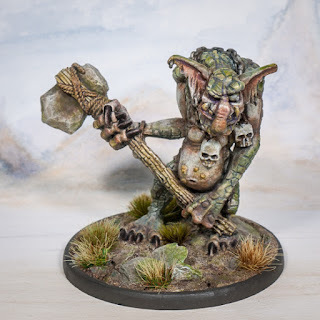 I am also not a fan of bright green skin on the gobbos, instead going for a darker olive green. Very nice if you need it I have a large spray tin of lurid green paint !